Background: When I graduated from junior high school to high school, I continued to be a student volunteer in the library. Again, I would be disappointed (but not surprised) that the school library did not have any books on hypnosis. (As opposed to the county library, where even sometimes the mobile library van that would come around the neighborhood every Friday during the summer would have one or two.) 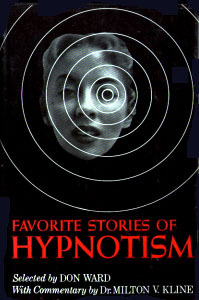 However, I was surprised to discover, at the very end of the story collection shelves, a hardcover copy of “Favorite Stories of Hypnotism” (1965) edited by Don Ward. The black cover with its shadowy female face, concentric circles radiating out from her left eye, is just so stereotypical but to my mind back then, so demonstrative of hypnosis that, of course, I had to check it out. I was not disappointed in what I found, and even today, many of the stories are still worthwhile, though dated.